Our Bicycle 'Tragic Royalty' Playing Cards offer a unique twist for your next card game. 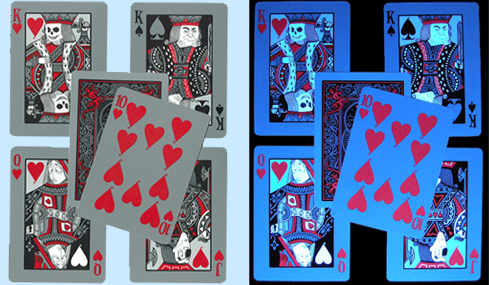 Designed with the traditional Bicycle Playing Card pattern on the back, the cards feature uniquely designed goulish and goofy court cards (kings, queens, and jacks) that glow when used under black light. Tragic Royalty Bicycle Playing Cards come in poker size, regular index. For additional information or wholesale pricing on Bicycle Playing Cards, please call 1-800-233-0828.